Erika Michanowicz, Regional Program Director, is our featured guest this week! She and CfR Western Pennsylvania team recently hosted a Regional Military Women’s retreat. Amazing and powerful stuff. Learn more below! 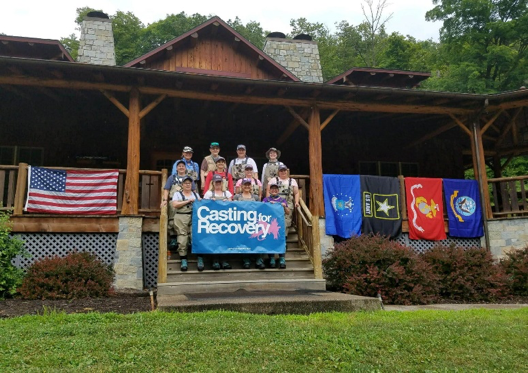 Over the weekend of July 13-15th, the CfR Western PA team had the honor of hosting the first-ever Casting for Recovery Pennsylvania Regional Military Women’s retreat. The weekend was filled with lots of laughing, sharing, bonding and casting! Twelve participants came from across the region to the beautiful HomeWaters Club in Spruce Creek, PA to take part in this special weekend specifically for them. The women came from Pennsylvania, Ohio, Virginia, Maryland and New York and represented the Army, Navy and Air Force. Even though they each came from different states and backgrounds, these amazing women shared two very powerful bonds – that of breast cancer and of serving our country. Even though the weather was hot and the fish did not come out to play much on Fishing Day, everyone had a fantastic time! It’s called ‘fishing,’ not ‘catching,’ right?! 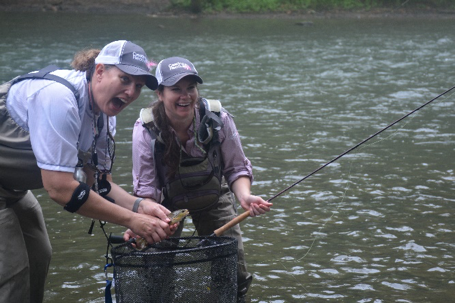 Charity caught a beautiful rainbow on a squirmy wormy and TJ caught a beautiful native brown trout on a dry fly! 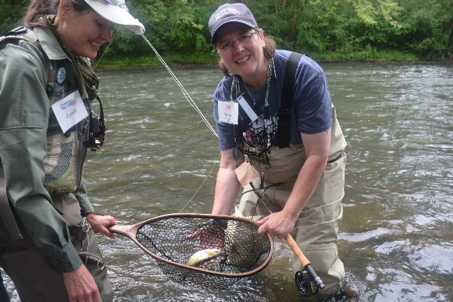 Many shared how grateful they were to have such a unique opportunity to relax, recharge, learn a new hobby, reconnect with nature and spend a weekend together with fellow military women with breast cancer. We are so grateful and honored to be able to provide them this fun and healing experience! Casting for Recovery will be hosting another military women’s retreat in Florida in November 2018! Please help us spread the word! Visit here for more information.